Modems connected through telephone lines or copper lines allow for long distance communication between two devices. The Leased-Line modems use voiceband communication which can be used on leased telephone lines, voice channels of microwave links and even dry copper lines. 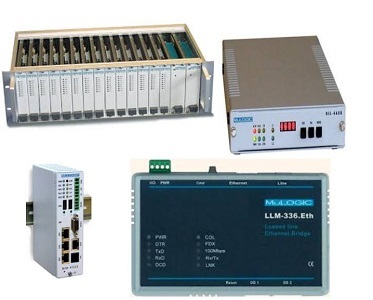 Ideal for industrial applications with SCADA protocols like Modbus RTU and TCP, DNP and more. The ADSL/VDSL2 units are modem/routers for internet and VPN access to/from remote locations. All these units are equipped with serial device servers connected to an RS232 and an RS485 port. Certain units can use cellular networks for back-up of thje ADSL/VDSL2 line, or can be used as dedicated Cellular router.